od, did I love the album that this song came from, and I still do. A Nod Is As Good As a Wink...to a Blind Horse has got to be one of the most hellacious rock-and-roll albums of all time. While most other acts were persuing sensitive singer/songwriter rock, Faces revitalized rebellious rock and roll. The music sounds as though it is bouncing off the walls while the bandmembers sound like they are counting on the same walls to hold them up. "What did I do with my drink?"..... "Stop fooling around, where is my underwear?"..... "What's that yer smokin'? Never mind, give me a hit."..... "Can you tune my guitar for me, I'm having trouble finding the neck?"..... "Help me, I've fallen down, and I can't get up." 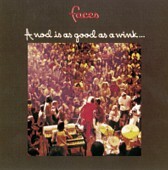 Released in Dec. 1971, The Faces' third album A Nod Is As Good As A Wink... To A Blind Horse peaked at the #6 position on the Billboard Hot 200 and stayed on the charts for 24 weeks. It was certified gold by the R.I.A.A. in February 1972. Considering the good-natured recklessness of the music, any of these quotes could summarize the nature of the band, but most of their songs are intelligent enough to convince me that they must have been sober when they were writing. Rehearsals, recording sessions, and live performances were something else altogether, however. On this album, they sound tanked -- and proud of it. The result is an accidental work of genius. At their worst, they were boring, uninspiring, and tepid. At their best, they were magnificently sloppy, loud, rude, and fun. "Stay with Me" has everything that made Faces a great band: careening slide guitars, powerhouse rhythms that shift restlessly from chugging to rollicking, and the craggy-voiced Rod Stewart howling over the amplifiers with all the charm of a schoolboy caught misbehaving. They may have been bad boys, but they were really good at being bad. All the members of Faces were stars of some sort before they came together. When Steve Marriot decided to abandon his mid-'60s mod outfit called Small Faces so that he could form Humble Pie with Peter Frampton, remaining members Kenny Jones, Ronnie Lane, and Ian MacLagan were left holding the pieces of an obsolete band. "Itchycoo Park" and a few others were great songs in the mid-'60s, but by the '70s they seemed about as dated as a Sonny and Cher tune. At the same time, Rod Stewart and Ronnie Wood were leaving the Jeff Beck Group and decided to join forces with the remains of the Small Faces. To signify the change, they simplified the name to Faces. They labored together for a few years until the band deconstructed, one member at a time. MacLagan went on to become a noted session musician, and Lane became a songwriter, sometime partner of Pete Townshend ("Rough Mix"), and a recipient of a superstar benefit show to aid him after he was diagnosed with multiple sclerosis. Jones joined the Who, Wood became a Rolling Stone, and Stewart became... well, he became Rod Stewart. MacLagan's laborings were usually anonymous, though, and Lane was forced to work much less than he would have liked. Replacing the deceased Keith Moon was like filling in for a legend, so by the time Jones joined the Who, they were barely an adequately parody of their former selves. Wood has done his best with the Glimmer Twins, but his revitalizing energy can only go so far, leaving the glory days of "the world's greatest rock and roll band" rooted firmly in the past. As for Stewart, he became a dandified tabloid star whose music grew even worse than his obscene image. Once upon a time, though, these five geezers were just mates out to have some fun and raise a little hell. They lived the life that every rebellious schoolboy dreamed of. Groupies, bawdiness, loud amplifiers, and a supply of Kentucky Bourbon made boys' night out a way of life. Their lack of consistency and strong individuality eventually doomed them, but "Stay with Me" proved that Faces at its best could be a cohesive band, even when behaving like incoherent lunatics. - Thomas Ryan, American Hit Radio, Prima Entertainment, 1996.